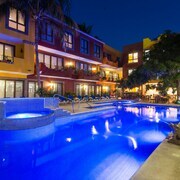 Located in North End, this hotel is within a 10-minute walk of Sayulita Square and Sayulita Farmers Market. Rancho Mi Chaparrita is 1.2 mi (2 km) away. 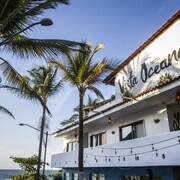 Located in North End, this hotel is within a 10-minute walk of Sayulita Farmers Market and Sayulita Square. Rancho Mi Chaparrita is 1.7 mi (2.8 km) away. 3 tips for new parents vacationing with grandparents. Opens in a new window. The artwork and overall vibe was absolutely perfect. Don Bonito felt trendy but not uncomfortably so. El lugar es muy bonito, pero no hay agua caliente, un día no tuvimos agua en el baño y regadera, no hay utensilios de cocina en la misma, y la atención de los recepcionistas es regular creo podrían mejorar bastante. Where to find Sayulita hotels near an airport? Where can I find hotels in Sayulita that are near tourist attractions? 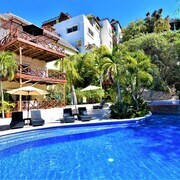 Visitors are simply spoiled for choice when it comes to securing comfortable accommodation in Sayulita. 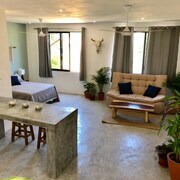 Spend some time checking out our 25 hotel listings, all of which can be found within a 0.1-kilometre (0.1-mile) radius of downtown Sayulita. A great option if you want to stay close to the middle of Sayulita is the Mesón del Perro. 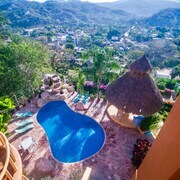 Hotels to book near Rancho Mi Chaparrita are the MBoutique Hotel Sayulita and Hotel y Suites Los Encantos. The Mesón del Perro and Hotel Don Miguel Plaza are near Sayulita Square. If, however, Sayulita Farmers Market will be your main focus, stay at the Refugio de Sol and Hostal San Pancho, as they are nearby. 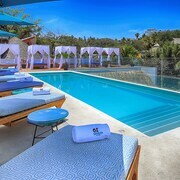 You could also check out the Imanta Resorts Punta de Mita and the Four Seasons Resort Punta Mita. The Imanta Resorts Punta de Mita is 6 kilometres (4 miles) from the center of Sayulita. The Four Seasons Resort Punta Mita is located 13 kilometres (8 miles) away. Two other options include the Grand Velas Riviera Nayarit All Inclusive and the Marival Residences Luxury Nuevo Vallarta All Inclusive. Why not spend the day visiting the Destiladeras Beach and the Litibu Golf Course in Punta Mita, 12 kilometres (7 miles) to the southwest of Sayulita. 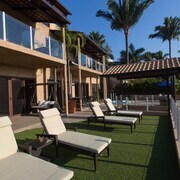 Should you wish to spend a few nights in Punta Mita, check Expedia's booking pages for the latest deals at the Cinco Hotel and Iberostar Playa Mita All Inclusive. 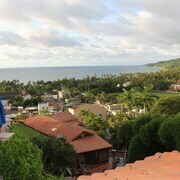 12 kilometres (7 miles) to the south of Sayulita is Cruz de Huanacaxtle, which is home to the Vallarta Gardens Resort and Spa - Luxury Villas and Grand Sirenis Matlali Hills Resort & Spa All inclusive. If you stay in Cruz de Huanacaxtle, set aside some time to visit La Cruz Square and the Marina Riviera Nayarit at La Cruz. Rincon de Guayabitos is the closest economic hub to Sayulita. It has a range of facilities, such as the Decameron Los Cocos All Inclusive and Villa Corona del Mar. The Tianguis Market and the Fisherman's Memorial are some of the places of interest around Rincon de Guayabitos. Rincon de Guayabitos is 25 kilometres (16 miles) from Sayulita. Licenciado Gustavo Diaz Ordaz International Airport is a convenient airport for accessing Sayulita. It is 30 kilometres (19 miles) away. If you would like to stay nearby, try the Casa Velas Luxury Boutique for Adults Only - All Inclusive or Velas Vallarta Suites Resort All Inclusive. What are the most popular Sayulita hotels? Are there hotels in other cities near Sayulita? 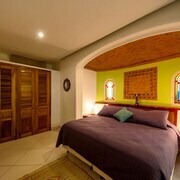 What other types of accommodations are available in Sayulita? 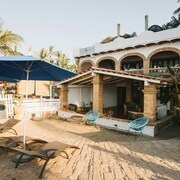 Explore Sayulita with Expedia.ca’s Travel Guides to find the best flights, cars, holiday packages and more!